Automakers are starting to get it. We don't want to deal with clunky interfaces and shoddy graphics. If we want to listen to our music and get directions, we want a dumb screen to connect to our smart phone. That's what Hyundai will be offering next year, and it'll be less expensive to boot. Next month at CES, Hyundai will show off its new Display Audio system. 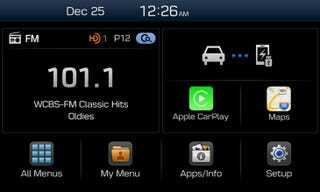 It's similar to what Chevy did with MyLink, utilizing a bare-bones setup with no embedded navigation or even a CD player. But Hyundai is relying on the driver's smartphone to run either Android Auto or Apple CarPlay, and it works with both, so it doesn't matter which mobile OS you prefer (unless you're a Windows or Blackberry holdout). If you're in the Apple ecosystem, Display Audio supports third party apps from Beats Music, iHeart Radio, MLB At Bat, Spotify, Stitcher, and CBS Radio News, as well as Apple's built-in Music and Podcasts apps. On the Android side you've got more of the same, but also SoundCloud, Pandora, and WhatsApp. Siri Eyes Free is included in the integration for iPhone users, while Google Now and voice actions are part of the Android experience. If you're still rocking your RAZR, Display Audio has standard SiriusXM, along with it's traffic data and incident alerts. AM and FM radio comes along for the ride, and Hyundai is also including its Blue Link telematics system that enables remote starting and climate control, along with traffic collision notifications. There's no word on price, but Hyundai is touting its affordability and expects the system to make up the majority of its head units after debuting on "select 2016" models.